Since President Obama took office, the US Chamber of Commerce's Big Business agenda has put it at odds on a host of issues with the Tea Party and limited government constitutional conservatives. The Chamber supported the Wall Street bailout, and then Obama's $787 billion stimulus package and subsequent government bailouts of Chrysler and General Motors. They opposed Cut, Cap and Balance and now support amnesty for illegal aliens, and, at time when American tech companies, like Microsoft, are laying off workers the Chamber supports allowing millions of "techno-coolie" guest workers into the country. 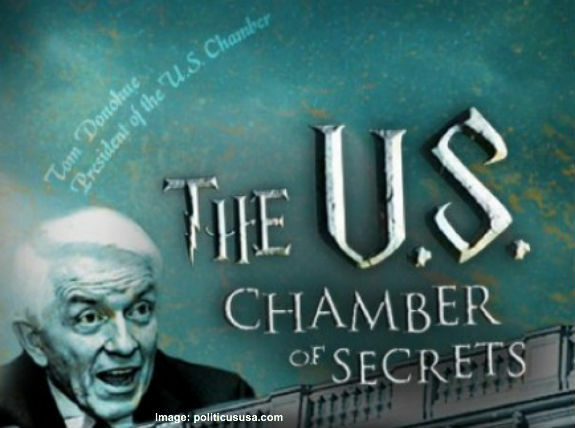 The US Chamber of Commerce and its CEO Tom Donohue and his chief political operative Scott Reed (architect of Bob Dole’s content-free disaster in 1996) spent $74 million on lobbying in 2013, according to CNN’s study of the data compiled by the Center For Responsive Politics. So far this year the Chamber has $17 million on Senate and House races, all of it on behalf of Republicans friendly to its version of Big Government Republicanism. Now Donohue, the leading advocate for amnesty for illegal aliens, has promised to spend $50 million raised from the cheap-labor wing of the business community to advance "comprehensive immigration reform," the number one goal of Obama’s second term. In CNN reporter Peter Hamby’s words that means “going in hard for allies like [Mississippi Senator Thad] Cochran and Senate Minority Leader Mitch McConnell, the kind of Republicans who don't recoil at terms like ‘appropriations’ and ‘earmarks’,” and the kind of federal spending that Chamber’s crony capitalist members and their lobbyists thrive upon and that Tea Partiers and grassroots limited government constitutional conservatives detest. Donohue, Reed and their allies have an agenda – and it is not to support free enterprise capitalism and reduce the intrusion of the federal government into the marketplace – it is nothing less than the hostile takeover of one of America’s two major political parties as they explain in a recent article by CNN’s Hamby. The Chamber's support for Big Business-friendly legislation – like “comprehensive immigration reform” and a pork-laden highway bill -- puts it on the same side of the political argument as Democrats and the other Bigs -- Big Labor and Big Government – that conservatives in the House and Senators such as Ted Cruz, Mike Lee and Rand Paul have staunchly resisted. But Democrats, tied as they are to Obama’s redistributionist policies, have not offered the Chamber a political lifeline on its larger agenda. The Chamber’s answer to this is to try to muscle out Tea Party-aligned Republicans in their primaries. Last week, they endorsed a GOP challenger to Michigan Rep. Justin Amash, an outspoken libertarian and “reliable thorn in the side of House Speaker John Boehner,” as CNN’s Peter Hamby put it. And with a 10-1 record in Republican primary elections this cycle, they and their allies in the establishment media would like you to believe they are succeeding in their effort to take over the Republican Party and purge its congressional delegation of limited government constitutional conservatives. Yet, when the light of day is shown on the Chamber’s agenda and Republican primary voters are told that electing a Chamber-backed candidate means more bailouts, more spending and amnesty for illegal aliens their candidates lose, as they did in the Eric Cantor vs. Dave Brat race in Virginia and the Jack Kingston vs. David Perdue Senate runoff in Georgia. As CHQ Chairman Richard Viguerie observed in his new book TAKEOVER, we have a two-party political system. One group of Americans has hijacked the Democrat Party and fools many Americans into voting for their progressive candidates by calling themselves “moderates.” Another group of Americans, led by the US Chamber of Commerce, has hijacked the Republican Party, which claims to represent conservatives, but all too often governs from the same Big Government progressive perspective as the so-called moderate Democrats. And while the US Chamber of Commerce may have money on its side, as Mr. Viguerie points out in his book TAKEOVER, we conservatives have the numbers and the grassroots support to control the Republican Party – if we will only organize it and focus it. It is hard for conservatives to understand that establishment Republicans are the enemy. They are not people who can simply be talked out of their commitment to Big Government; they must be defeated because they are blocking the path to saving America. If we conservatives act like just another pressure group – like the US Chamber of Commerce – we are going to lose, because we can never outbid Big Business for the services of the GOP elite. Submitted by David Givens on Sat, 08/02/2014 - 18:46. It’s said that “Money is the mother’s milk of politics.” If so, votes are its life’s blood! Let’s continue to primary RINOS. If the RINO gets on the ballot anyway — vote for the Democrat. If we are going to have a linguini-spined liberatard he may as well have a “D” after his name. All Republicans depend on Conservative votes. Let them see what happens when the conservatives vote against them in mass! Do this selectively so we do not lose the house. Let the Senate go for a couple of years if necessary. Any elected official who does not support our program we hound out of office. We continue to actively work against these legislators who do not understand for whom they work year after year until we have gotten rid of them. Even after our program is law and implemented, we oppose them. No matter what good things they promise or do, we oppose them. We oppose them until they get a real job and get out of our government!